Format: Weekly anthology title, all reprints of US series. Comments: Titans, which began publication on 25th October 1975, marked a formatting experiment for Marvel UK. Like all Marvel UK titles to that point, it reprinted US comics, but Titans was presented as a landscape title, longer than it was tall, with the American pages reduced in size and printed two alongside each other for each page of Titans, allowing Titans to present double the reprint material of other books. 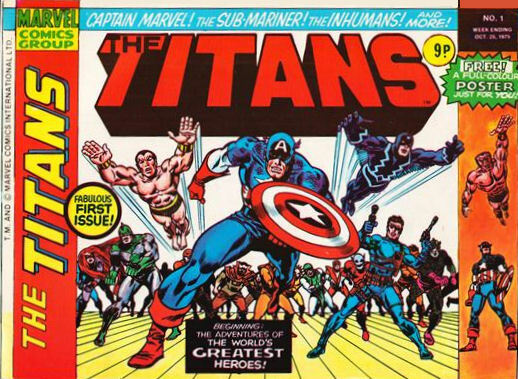 The first issue reprinted the Inhumans from Amazing Adventures, Captain America, Nick Fury, Sub-Mariner and Captain Marvel, but since Titans raced through the available reprint material new strips were soon needed. The Inhumans bowed out with #12, to be replaced by the X-Men in #13, whotook a break to makespace for Fantastic Four, which began in #27. Ghost Rider joined in #31, replacing Captain Marvel, and the Avengers started around #53. Titans was cancelled with its 58th issue on 24th November 1976, and merged into Super Spider-Man and the Super-Heroes with that series' #199, which marked the merger by retitling as Super Spider-Man and the Titans.